Cell phones and computers are commonplace in every office, school, or home. But, there's something about a good spiral-bound notebook that these digital screens can't replace. These versatile paper pads are stylish, functional and most importantly, have a purpose. A custom notebook makes the perfect gift for your employees or clients. When a good idea strikes, every second spent hunting for a paper and pen feels like an eternity. Why not solve that problem with a promotional notebook? Choose from a variety of premium designs and personalize them with your company logo or name. For the environmentally conscious, we offer Several styles made from recycled materials. Not sure what you want? Let us help! Our professional product experts will help you create something your clients or employees will love. Attractive spiral-bound custom notebook with tabbed foldover cover. Perfect for jotting quick notes at conferences and trade shows! This Spotted Custom Notebook w/ Stylus Pen & Sticky Notes features three useful products in one notebook. The 5"w x 7"h Heather Lined Custom Notebook is a trendy way to promote your upcoming event. The heathered material gives it a retail look that will appreciated by all. Need to take notes on-the-go? This Mini Spiral Lined Custom Notebook w/ Flap Closure is pocket sized and perfect for jotting down memos anywhere you go. This large Executive Pocket Custom Notebook features a front pocket that holds a smartphone, as well as a slot for business cards! The color matching ribbon ensures recipients can easily mark their place. The size of this Mini Spiral Curve Custom Notebook w/ Pen makes it easy to take with you everywhere! Jot down notes on-the-go in this pocket sized notebook. Perfect for conferences and trade shows! This Executive Elastic Pocket Custom Notebook is available in 6 colors, and features a color matching ribbon page marker. The large elastic pocket is perfectly sized to hold a smartphone. This promo notebook doubles as a portable office, with pen, ruler, color-coded self-stick tabs, and memo pad included. Everyone will notice your company logo on this unique custom notebook that features a clear window ID pouch. This recycled cardboard custom journal book features a hand sewn binding that gets back to the roots of your eco-message. Personalized spiral notebooks make great registration gifts at your next convention! Attendees will find them useful to taking notes and staying organized. Then, when they're reviewing what they learned with their coworkers, your logo's on prominent display! These jotters are great for employee appreciation gifts, too. Hand them out at trade shows, holiday parties, or company retreats. As a gift, a personalized pad is versatile and always appreciated. Our custom spiral notebooks make perfect gifts because they pull double duty as marketing material. Every time your employee or client pulls out the notebook you gave them, your logo's on display. Think of them like a small printed advertisement that your clients love showing off to their friends! Personalized notebooks can also help a band, team, or sports club raise money. Sell spiral-bound notebooks to help you fund your next event or concert. Your custom logo helps promote your business longer than a flyer or brochure ever could. At ePromos, we offer one of the largest selections of notepads, making it easy to find something you love. Our notebooks come in many sizes, colors and style. From a slim black book small enough for a purse to something that only fits on your desk, we have it all. If squares and rectangles feel outdated, our collection includes several fun and unique designs. Celebrate valentine's day with a heart-shaped notebook, or earth day with a globe. 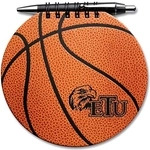 If your office is full of sports fans, get a notebook shaped like a soccer ball, baseball, basketball, or golf ball. We offer a range of professionals-themed personalized notebooks as well, even ones that look like medical scrubs! We offer personalized notebooks made from a variety of premium materials, including: aluminum, leather, plastic, fabric, recyclable paper and more. Choose your favorite pad from well-known brands like Appeel®, BIC®, Cutter & Buck®, or Scripto®. Once you select your perfect style, we'll help you customize it with your logo or brand. Depending on what you choose, we offer a range of pens and other matching office supplies you can gift with your personalized notebook. Our collection includes both hardcover and soft cover notebooks. With so many choices, you can find something as professional, or fun, as you'd like! Every time someone uses their notebook, they'll be thinking about your business. Contact one of our promotional product specialists today to learn how easy it is to get great custom printed items from ePromos. Our Brand Consultants work hard to make sure you're satisfied with every promotional products order.